In this project, we investigate the potential of dynamic arrangements of a comprehensive coin collection along a diverse set of facets such as origin, type of material, period, weight, and size. 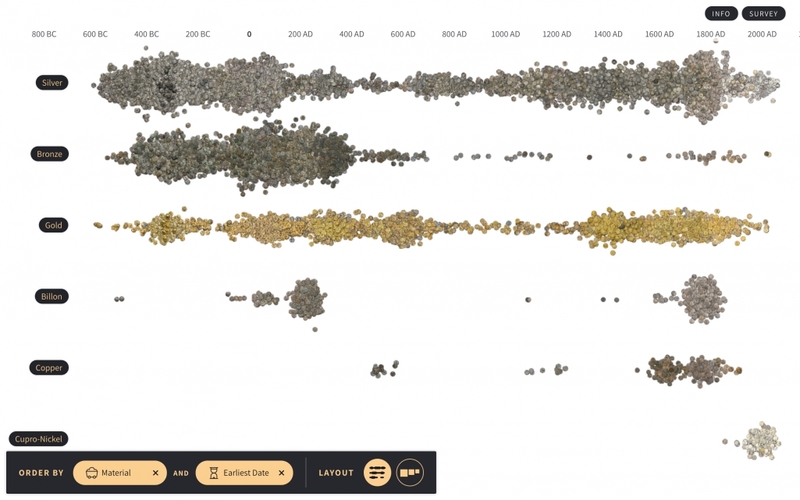 The resulting layouts blur the boundary between the physical display of coins and the representation of abstract data patterns characterizing the collection. Comprising over half a million coins and medals, the Münzkabinett Berlin is one of the most significant numismatic collections in the world. The Münzkabinett has been investing considerable resources into digitization processes over the past ten years with a strong focus on the semantic annotation of the historic coins and publication via web portals. Despite theses efforts to expose the collection more broadly, the physical and digital display of the collection has been relatively limited. The coins almost always end up in tabular grids: regardless whether in the storage drawers of the depot, the glass cabinets in the exhibition, or thumbnail pages in the online collection. While ubiquitous across collecting institutions, these static and rigid arrangements lack the potential to convey the semantic relationships and physical patterns embedded in this large collection. The overall aim behind this research project is to conceive alternative arrangements that do justice to the multidimensional and material abundance that the collection exhibits while providing a playful mode of access that is inviting to a lay audience. The iterative design process consisted of visits to the physical museum as well as to the online database, co-creation activities such as a collaging workshop with numismaticians, and finally typical design methods such as sketching and prototyping interleaved with feedback sessions and evaluation. 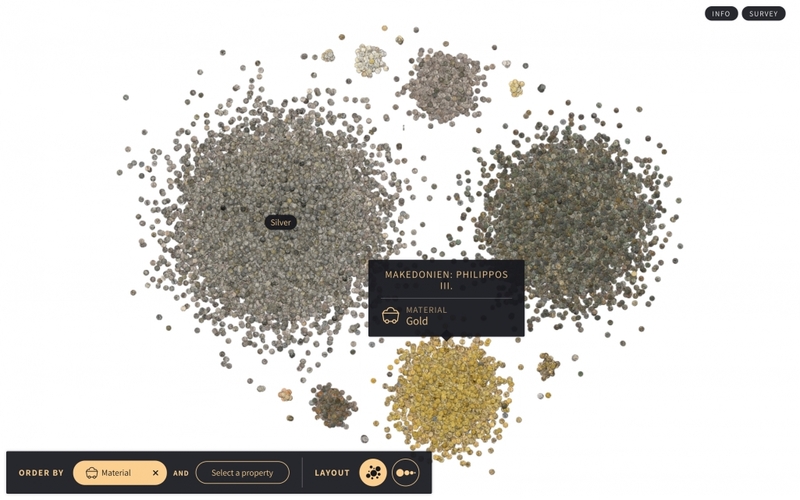 In contrast to prior work on visualizing cultural collections of material artifacts, we have the specific ambition to develop more flexible and meaningful displays that would fit the identity of the coin collection. 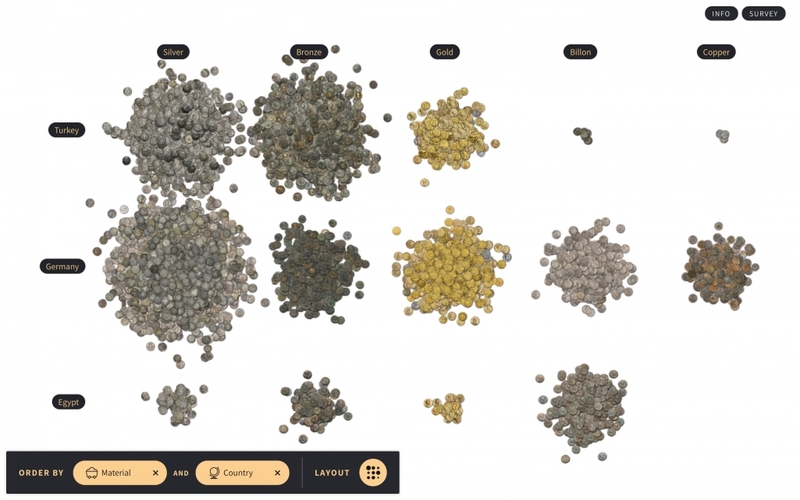 The resulting visualization system represents the numismatic collection using overview layouts that relate the material nature of the coins with their historical context. In the dynamic arrangements it becomes possible to gain an impression of its total size and generate new insights by sorting the coins along diverse criteria. These layouts reminisce physical arrangements of coins that detest the rigid order of tables and grids. For example, coins can be placed into separate piles each representing a given metal type or country of origin. Another layout is a stream that visualizes the ebb and flow of coins that can be teased apart by another dimension such as coin type. Across all these arrangements the visualizations are made up of the images of the coins. When a parameter of the layout is changed all coins gradually rearrange themselves resulting in evocative transitions. This project is a collaboration with the Münzkabinett Berlin. Information Is Beautiful Award 2018 SILVER in Arts, Entertainment & Culture. This research explores the merit of alternative arrangements of cultural artifacts to expose the aesthetic abundance of a cultural collection. The conventional display of museum objects in online interfaces tends to neglect the physical gestalt of the collection. For example, coins typically end up in tabular grids of thumbnail pages in online collections mimicking their rigid placement in storage drawers of a depot and glass cabinets in exhibitions. The overall aim behind this research was to devise visualizations that do justice to the material and semantic richness of an entire collection, while providing a casual mode of access that is inviting to people with no background in numismatics. To do this, we undertook an iterative design process, which involved a close collaboration with numismaticians and playful ideation with actual coins. Carefully negotiating expert knowledge and lay curiosity, the resulting visualization represents the collection’s dimensions using thousands of thumbnails as visual data points. The coins can be arranged into various layouts such as piles representing, for example, metal types, or streams visualizing the ebb and flow of coins over the centuries. In the interface, one can play with the coins in a manner that would be unthinkable in a physical exhibition and that has not been tried in a digital display. The article reports on the overall research and design process of this project, the resulting interface concept and prototype, and the feedback received during two evaluations.